For a great kids craft project, create personalized masquerade masks. 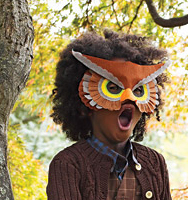 Kids love creating masks that they can play dress up in or wear at a party. Create masks during the party as a party craft or create them in advance and decorate for the party with the custom creations. Coordinate the mask and accents to the color scheme and theme of your particular party. Making a mask is a fun activity for a Mardi Gras party, but it does not have to be limited to a Mardi Gras theme. This craft could be great for all different types of parties. Animal masks: cow, duck, pig, etc. Start with a basic paper mache masks or fabric masks and festive decorations like gems, glitter, feathers, confetti, ribbon or mardi gras beads. A paper mache mask allows children to color, paint or use markers. They could also cover the mask in fabric or decorative paper (attach either with spray adhesive or fabric glue). Using markers allows them to keep decorating with out any down time. With paint or glue, allow time for the mask to dry before you move on to adding accents. They can glue on feathers or ribbon. Mardi Gras beads make great accents. Use strands of standard throw beads to add definition or outline shapes. Here the eyes of the mask are outlined in metallic gold beads. The finished masquerade mask creation! Proudly modeling her mask creation! I love all these Picture and think this is awesome.yes really Making a mask is a fun activity..